Around 10,000 people gathered in the Boston Common on Saturday as numerous civil rights activists spoke at the third Boston Women's March, headlined by Representative Ayanna Pressley. At 10 a.m. Saturday, Boston Common could have been a scene from any ordinary weekend. People ice skated on the pond, children filled the playground, guides led visitors on tours along the paths. Two years ago, the large green space could hardly contain the massive crowd that gathered. 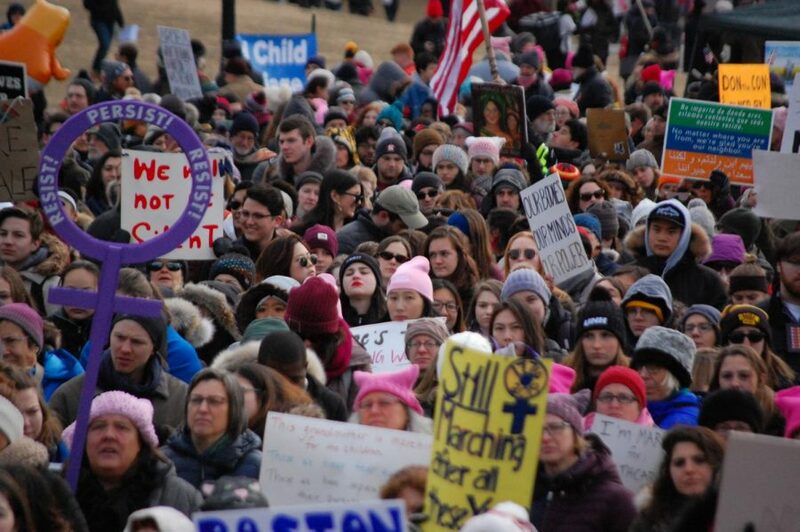 Between 8,000 and 10,000 “pussyhat” wearers, students, children and people of various ideologies and backgrounds gathered on the Common for the third annual Boston Women’s March. The 2017 Women’s March directly followed the inauguration of President Donald J. Trump, and filled the Common with a crowd of 175,000. Last year, just 10,000 gathered in the Cambridge Common to protest. The decreased attendance begs the question, what has changed in the last three years? The same message is prevalent: a voice ringing, “We have had enough.” But now there is a different agenda, one of speaking out about intersectionality in all issues amid the controversy of anti-Semitic alliances within the leadership of the national Women’s March movement. Boston Police estimate between 8,000-10,000 people were at Boston Common on Saturday. Demands for women’s rights in all aspects of life remained at the forefront of the protest, inclusive of all identifying women, regardless of color and race. Strength in numbers and hope are still staples of the movement. Natasha Gonzalez, a sophomore education major at Lesley University, attended the march for reasons that percolated in years past — unity and hope. As a young woman at the march, the idea of fighting for women’s rights on a platform that does not discriminate based on age, gender identity or race is encouraging to her. “Women’s rights are human rights,” Gonzalez said. Esther Anastasia, a protester whose husband is a federal worker at the Federal Aviation Administration a department deeply affected by the largest government shutdown in U.S. history, held a sign protesting the lack of government initiative. “People have gotten more used to the things that infuriated us during the first march, but now there’s a more mature reaction,” Anastasia said. Northeastern alum Jackie Rothmeier had similar reasons for attending this march. A member of Strong Women Strong Girls, a mentoring organization based in Massachusetts for young girls, Rothmeier participated in the conversation about women’s rights. Her sentiments have not changed since January 2017. “I’m still deeply frustrated and angry about the decisions being made in the White House, namely the current discussion on immigration reform and border security,” Rothmeier said. Resentment of people in power acting for their voters rather than the greater good of the nation is strong, and this reality is becoming more sobering as the current administration presses on. Ariel Jones, a demonstrator Saturday and history teacher from Ohio, argued with the few Trump supporters present, particularly with one individual wearing a Trump hat and a No. 20 Trump U.S.A. mock football jersey. “This country has never empowered women fully and that has become in itself empowered through Donald Trump’s election and through the people that he has allowed to make policy,” Jones said. She donned a “pussyhat” and held up a bright pink sign as she stood defiantly next to the Trump supporters and counter-protesters surrounded by a ring of Boston Police officers with neon vests and large black bicycles. “I don’t want that for myself, I don’t want that for my children, and it has to stop,” Jones said. Consistency in the movement has been rooted year after year in women’s autonomy to make decisions for themselves, Jones said. Amid the positivity of an inclusive message, leaders and organizers still had something to prove in terms of forged alliances. When the co-chair of the national Women’s March, Tamika Mallory, refused to denounce the Nation of Islam leader Louis Farrakhan after his anti-Semitic rhetoric at a rally during which he warned listeners of “Satanic Jews,” the march lost much of the backing of the center-left. Many local marches nationwide chose to separate from the organization, as the group’s leaders struggled to deal with the gravity of these accusations. There was certainly a dip in attendance on the Common this Saturday. Some wonder if the digital aspect of organizing mass movements, as New York Times opinion columnist Michelle Goldberg pointed out, contributes to this. As movements get bigger online, the less need there is for strong and capable leaders, Goldberg wrote. But people like Rothmeier believe the digitalization of the movement has only cultivated a larger connection to younger audiences. 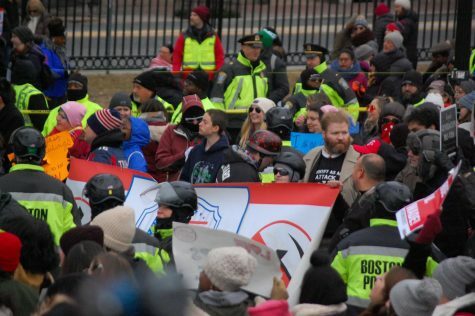 One thing that stood out this year was the presence of Trump supporters and anti-protesters, huddled in the safe pocket the Boston Police officers provided near the stage as they shouted chants like “Babies’ lives matter,” and “Build the wall,” as speakers talked of their experience with abortion and advocated for reproductive rights, and derided Trump’s efforts to build a wall on the southern border. As Representative Ayanna Pressley, the honorary chair of the march, came on stage to speak and commemorate Martin Luther King Jr. Day, the anti-protesters shouted “build the wall,” and “all lives matter,” inciting the crowd around them. According to Boston Police Captain Kelley McCormick, groups in collaboration with the police force such as the EMS, the American Civil Liberties Union and the National Lawyers Guild helped keep the peace. Hidden behind a circle of police bicycles, David Cain, who identified as a Ted Cruz voter and blogger, explained his reasons for being at the march. A small group of counter-protesters stand near the stage, surrounded by a protective circle of Boston Police officers. They chanted throughout the program, but were often drowned out by the thousands surrounding them. 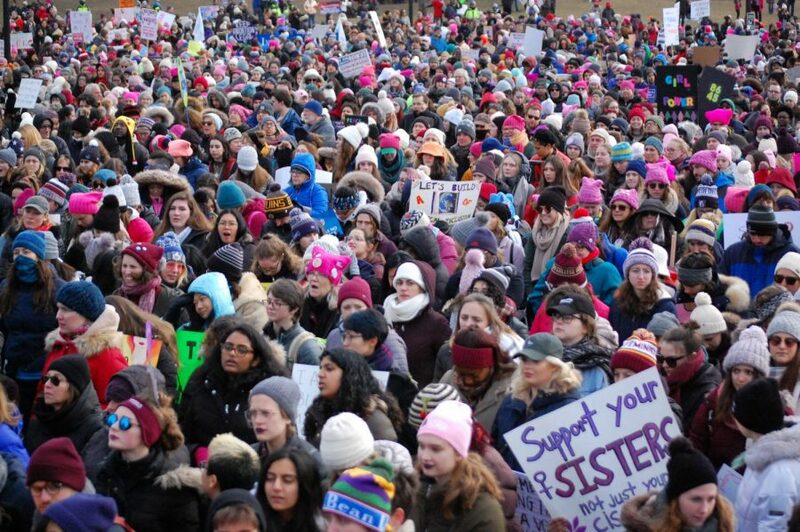 This year, the Boston Women’s March showcased a variety of speakers from many marginalized communities, ranging from Indigenous rights activists in the United American Indians of New England to the executive director of the Jewish Alliance for Law and Social Action, Cindy Rowe. Rowe talked about focusing on the message against hate, rather than the separating factors that have clouded the image of the movement in recent weeks. Sullivan also spoke about the collective goals for women in the movement and silenced claims of non-inclusion in her speech. The first march in 2017 was largely reactionary, and relatively new. It was a platform on which to express the need for change, without emphasis on organization. Nevertheless, it was a catalyst for future organizational change in the realm of intersectionality and women’s rights. Two years ago, the march was held on the Boston Common, but last year it was held in Cambridge. According to Karen Cosmas, the executive director of the Women’s March movement in Boston, the issue was not about the number of attendees. “2017 was held at this site and in 2018 the March Forward was supporting a range of women leaders locally to take the march into 23 different communities. Cambridge just happened to have the largest of these communities,” Cosmas said. Last year, the Cambridge Police Department estimated 10,000 people attended the rally, which filled the city’s Common. According to the January Coalition website, the event didn’t take place in the Boston Common because organizers knew they would not be able to fill the space. The January Coalition is the organization that planned the 2018 march. When asked about the alleged anti-Semitism within the leadership of the national march movement, Cosmas pointed to Saturday’s events rather than address the issue head-on. Protesters also had things to say about the serious allegations in the leadership of the march. Indeed, the march had a variety of speakers all touching on the notion of intersectionality in their messages. One such group was the YW Boston’s Youth Leadership Initiative, a social justice program for young students around Boston, whose speakers were Isabella Brooke, Ikraam Mohamud and Miranda Graves. Sullivan of the NAACP also brought in messages of cross-cutting change initiatives, and getting congressional action to back these goals. Sullivan, who spoke early in the program, made intersectionality the focus of this year’s march, bringing up the intolerance of any anti-Semitic sentiment and framing the movement forward as a collaborative effort. Paxtyn Merten contributed to this report. Footage courtesy of Corey Dockser and Connor Friday, NUTV News.